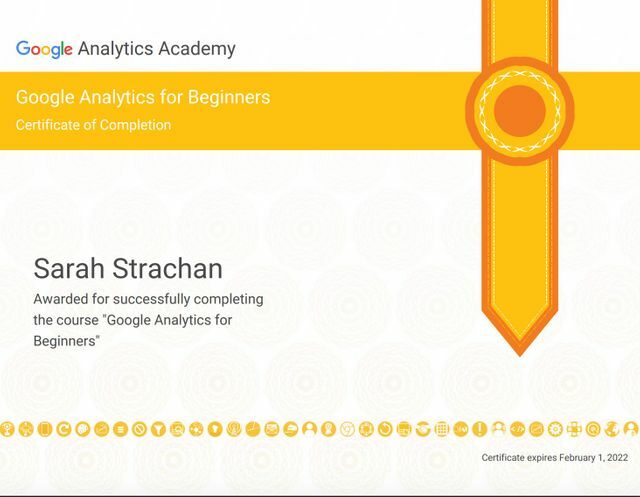 This morning I sat down and completed the Google Analytics Beginners Certification. Google's Analytics Academy offers you the chance to take free online courses to learn both the basic and advanced features of the software. Having completed an MSc in Analytics, I have been looking for ways to understand the behaviour of our consumers so I can provide insights for successful strategies. This course offered the perfect opportunity to understand and really make use of the data that is collected by Google Analytics. Bounce rate - The bounce rate is the percentage of users who left after viewing a single page on your site and taking no additional action. The bounce rate is a good indication of the performances of different landing pages of your website. You can easily see the bounce rate of each page and compare it to the site average, therefore understanding which pages might need additional work. Campaign tracking - Google Analytics allows you track and tag your different marketing campaigns. You can then see which campaigns are driving the most people to your website. New users - You can easily see how many new users have come to your site in a certain time period. To make this even more interesting you can add a secondary dimension to this and analyse what countries these new users are coming from. This may present an opportunity for expansion into a new market. If your company have added Google Analytics tracking codes to your website, it would be really useful for someone in your organisation to take the time to complete these courses and become certified. Signing up is really easy. Simply follow this link to get going. My aim is to complete the Advanced Course and the Super User Course over the next month, and I will be writing follow-up content for both of these.